This season's Big 12 Coach of the Year, Texas men's golf head coach John Fields is a finalist for the Dave Williams National Coach of the Year Award (photo courtesy of texassports.com). AUSTIN, Texas — John Fields, the head coach of the No. 2 University of Texas men’s golf team, has been named by the Golf Coaches Association of America as a finalist for this year’s Dave Williams National Coach of the Year Award. Fields has led the Longhorns to seven wins this season, including seven of the last nine tournaments in which they played, and was named this season’s Big 12 Coach of the Year. The other candidates for the national award are Alan Bratton of Oklahoma State, Chris Haack of Georgia, Conrad Ray of Stanford and Mike Small of Illinois. If a team other than Texas, Oklahoma State, Georgia, Stanford or Illinois wins the national championship, that team’s coach will be added to the list of candidates. 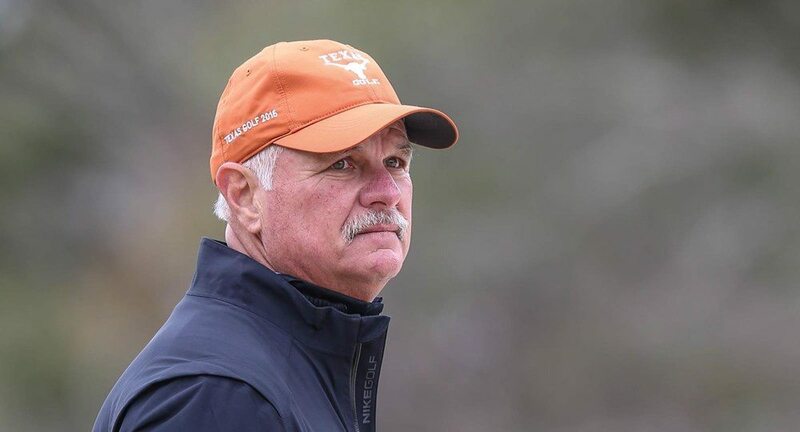 This year’s Texas team is among the best ever for Fields, who has been UT’s coach since 1997 and has guided the Longhorns to five top-five finishes at the NCAA Championships. He also has helped the team finish among the top 10 in the final national rankings seven times.